Enter a world of Star Wars duels with the Rey Starter Set for Star Wars: Destiny! With an array of characters that spans the saga from Star Wars: Episode I - The Phantom Menace to Star Wars: Episode VII - The Force Awakens, Star Wars: Destiny Rey Starter Set gives you the freedom to play out any battle you can imagine. Innovative gameplay blends dice and cards as you strategize exactly how to defeat your opponent's characters. 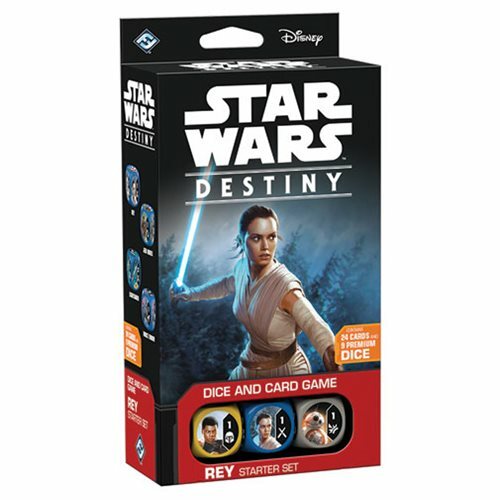 Within the Star Wars: Destiny Rey Starter Set, you'll find a fixed set of 24 heroic cards with 9 premium dice, alongside tokens and a rule sheet—everything you need for 1 player fight for the light side across the galaxy. Ages 14 and up.